WinterView is an array data viewer, which can be used to view 2-dimensional numeric data stored in CSV (comma separated value) or TSV (tab separated value) format. Colour and transparency data in bit image files can also be examined. The Winteracter library includes facilities to easily save the contents of grid controls or 2-dimensional data arrays as CSV or TSV files, which can be visualised in WinterView. The data viewer can also be used to convert XYZ co-ordinates to gridded data and view the resulting data in the same way as CSV files. Bit image data files in BMP, PCX, PNG, JPEG, ICO or CUR format can also be viewed. 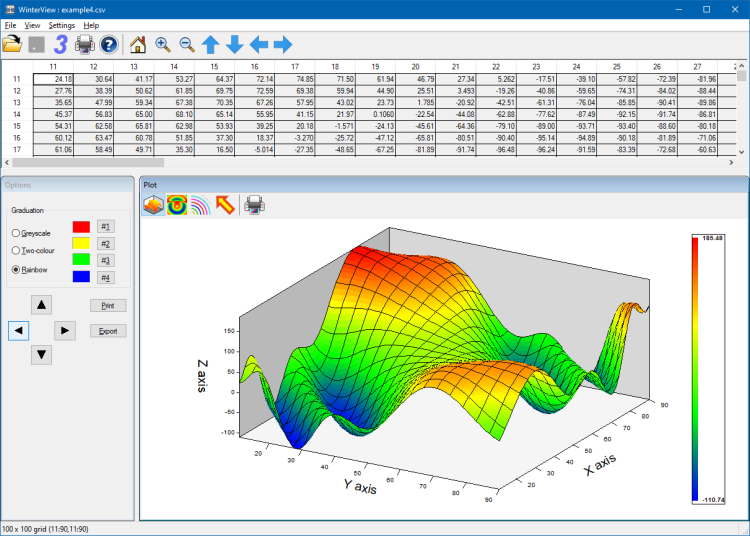 The raw data is displayed in a grid, along with a graphical display of the data in the form of a 3D surface, 2D contour plot (filled or line based) or 2D vector plot. The data grid is displayed read-only by default, but an editing option is provided. When viewing bit image files, the grid shows the raw pixel data and the plot window shows the bitmap itself. Zoom and pan options allow examination of sub-areas of the data. Each of the grid and plot can be printed via Print Manager (Windows) or PostScript (X Windows). The plot can also be exported in a variety of graphics file formats, namely BMP, PCX, PNG, JPEG/JFIF, EPS, CGM, SVG, HP-GL, HP-GL/2 and DXF. The Windows version can also export in WMF/EMF formats. The 3D surface representation can also be exported as a 3D model file (W3D, DXF or STL format), allowing it to be viewed via OpenGL in Winteracter's 3Dview tool. As an added bonus, WinterView can be redistributed with Winteracter based applications. Full source code for WinterView is also supplied. Creation and distribution of derivative works, based on this source code, is permitted. Click here to return to Visual Tools page.